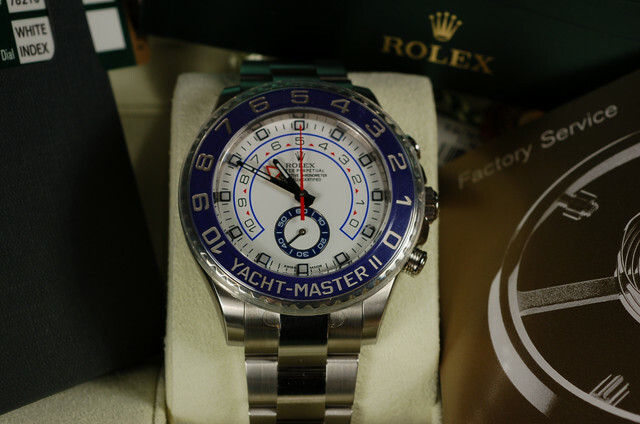 For sale is a 99% condition Rolex Yacht-Master II 116680. 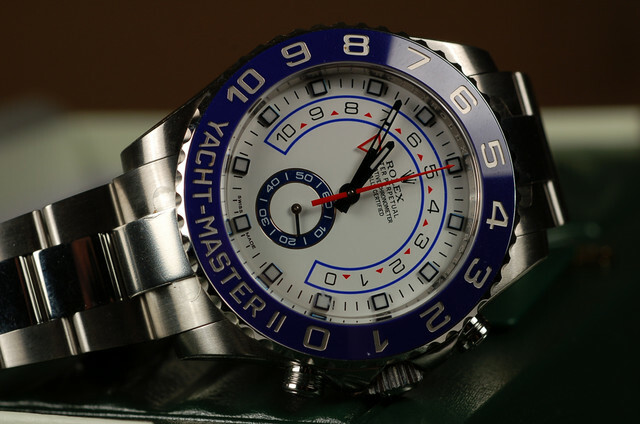 It is one of the largest Rolex sport watches in 44mm 904L stainless steel case. The Rolex caliber # 4161 chronograph movement is made up of more than 360 components and packed full of Rolex's latest and most innovative technologies. 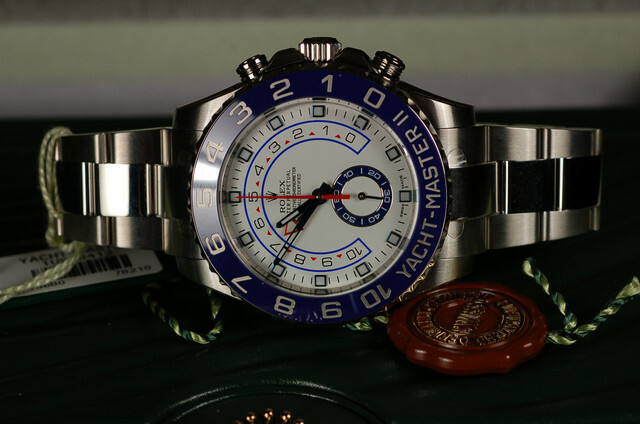 Features a 90 degree rotatable Command bezel with blue Cerachrom insert, matt white dial with blue lacquer small seconds counter. 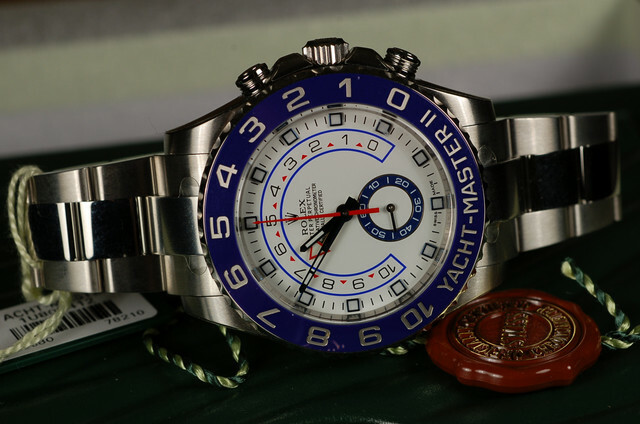 For me, it is a rugged, complicated, and gorgeous sports Rolex timepiece you should buy today! 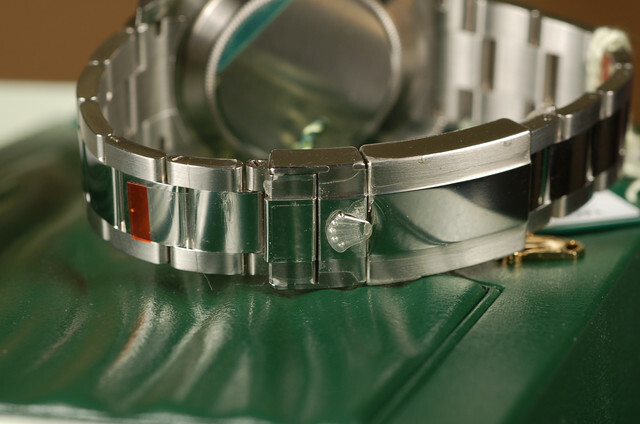 All factory applied stickers are still on the watch and bracelet! You cannot find another one in this perfect condition. The bracelet is sized but never been worn. All original links are included. Every function works as it should. Keeping great time within COSC specifications. This package is completed as new. All original boxes & white sleeve, manual, booklets, hangtags (matching random serial #), COSC tag, bezel protector and warranty card dated 12/2014 by US authorized dealer. It is a safe queen since the day one. Please carefully review these pictures taken by me today. NOS condition indeed! Current retail is $18,750 plus tax. My asking price is only $13,750 plus shipping and insurance. Payment by Wire transfer or Bank direct deposit. Rolex trade will be considered. I am located in Boston, MA. Local F2F transaction is welcome. Many worldwide references on Timezone, Watchnet, TRF, Paneristi upon request. You are welcome to PM / send email to danielszeto AT Yahoo dot com / text me at (617) 480 Eight794. Thanks for looking!